vtlib is a scene graph library built on top of OpenSceneGraph and the vtdata library which handles many kinds of geospatial data. It extends vtdata with the ability to create 3D geometry of the geodata for interactive visualization. It is part of the Virtual Terrain Project and distributed under a completely free open source license. 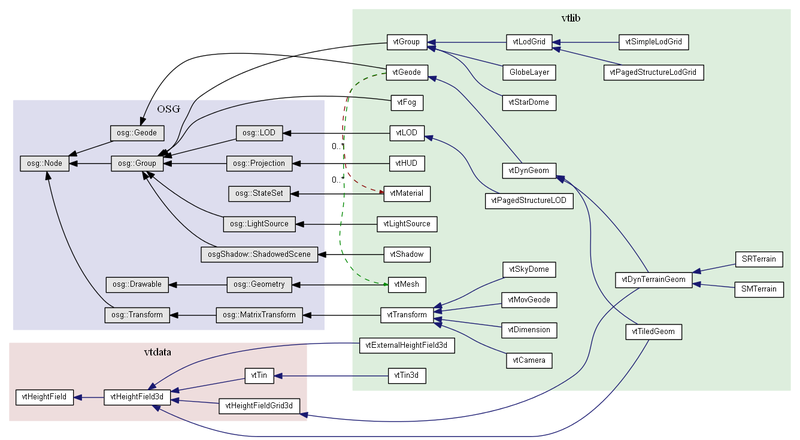 Because it is higher-level, vtlib lets you construct 3D geometry and simulations much faster and easier than using lower-level libraries like OSG and OpenGL directly. In addition to these automatically generated pages, programmer documentation for vtlib is also available online.